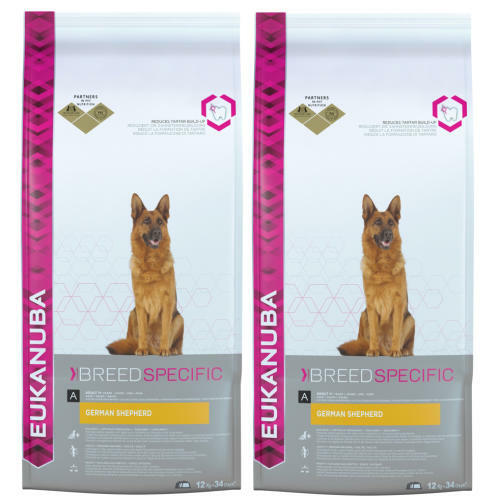 Eukanuba German Shepherd is the ideal way to provide your adult German or Belgian Shepherd dog with balanced, breed specific nutrition. A complete dog food made with beet pulp as a natural source of prebiotics, which promote a balance of friendly bacteria in your pet’s tummy, contributing towards a healthy digestive system. With Glucosamine and Chondroitin Sulphate to help look after and repair your German Shepherds joints for increased mobility, as well as L-Carnitine to naturally assist in the burning of fat, Eukanuba German Shepherd is the perfect daily diet for your canine. Dried Chicken And Turkey (24%), Maize, Rice, Wheat, Animal Fat, Dried Beet Pulp (2.8%),Hydrolysed Animal Proteins, Dried Whole Egg, Potassium Chloride, Fructooligosaccharides (0.52%), Fish Oil, Sodium Chloride, Sodium Hexametaphosphate, Calcium Carbonate, Linseed, Glucosamine (432mg/Kg), Chondroitin Sulphate (43mg/Kg). Protein 23.0%, Fat Content 13.0%, Omega-6 Fatty Acids 2.19%, Omega-3 Fatty Acids 0.34%, Moisture 8.00%, Crude Ash 6.40%, Crude Fibres 2.10%, Calcium 1.10%, Phosphorus 0.85%.